This Chioggia Beet Carpaccio with arugula and fresh goat’s cheese balls is such a beautiful and impressive starter. It’s bright and colourful and a party for your eyes. 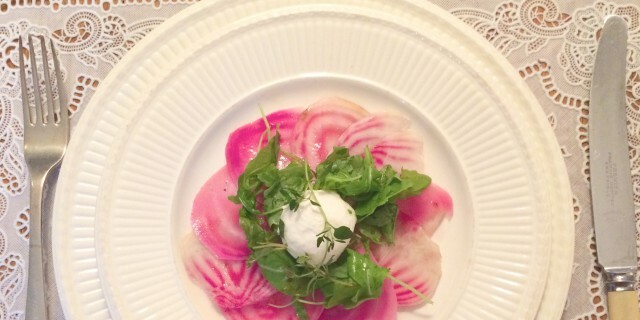 The pink-white stripes of the chioggia beets contrast beautifully with the white goat’s cheese and green arugula. The pickling gives the sturdy chioggia beets a soft but still firm texture, which creates a lovely bite in your mouth. The pickling also transforms the earthiness of the beets into a more subtle flavour, sweet, refreshing and tangy. The sweet, tangy flavour of the beets combines really well with the soft goat’s cheese, citrusy thyme and bitter arugula. For the goat’s cheese, I used ‘Egmondse bollen’. ‘Egmondse bollen’ are a truly delicacy. They are fresh goat’s cheese balls ‘soaked’ in olive oil with herbs like rosemary and thyme. You can buy them from dairy farm de Klompenhoeve. If you cannot find ‘Egmondse bollen’, any mild and soft fresh soft goat’s cheese will do. To pickle the beets add the beet slices to a wide-mouth canning jar or tupperware conainer. Add lemon juice and zest, apple cider vinegar, black peppercorns, ginger, thyme and honey. Shake well, seal the jar and place in the fridge for at least 1/2 hour, but preferably longer so the flavours can infuse into the beets. Place the pickled beet slices carpaccio-style on a plate. Place a fresh goat’s cheese ball in the center of the plate and add arugula around the center. Sprinkle with fresh thyme leaves and drizzle with the balsamic dressing. Season with freshly ground black pepper and sea salt.